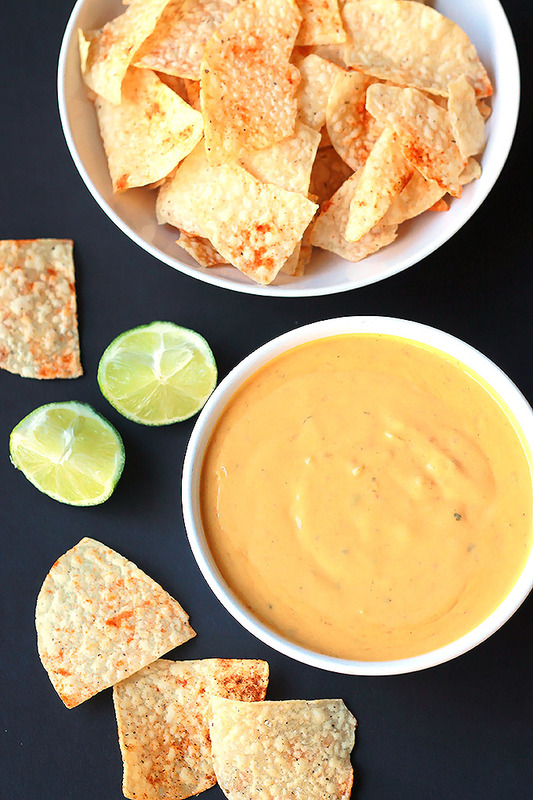 Vegan Queso with Spiced Tortilla Chips – Smooth, creamy and oh-so-delicious, you just might forget it’s not real cheese. 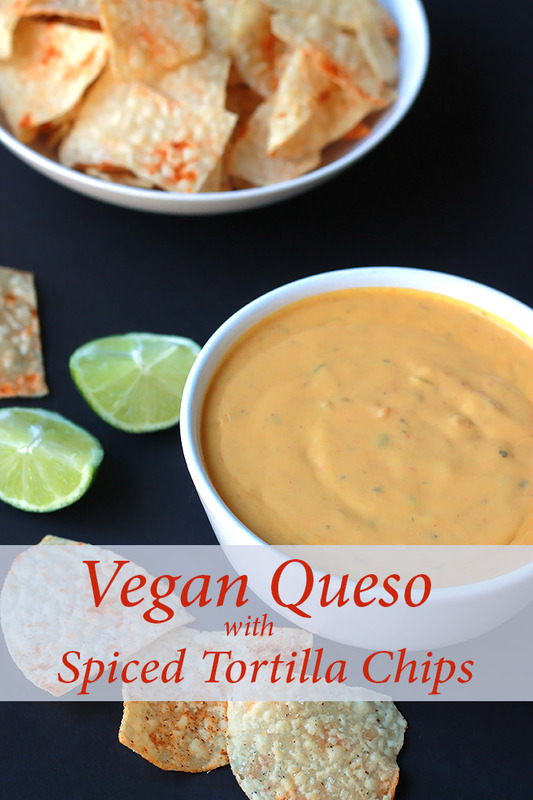 I’m so excited about this Vegan Queso with Spiced Tortilla Chips recipe, I adapted the Queso dip from a Vegan Cheese recipe I found on Simple Vegan Blog, it is absolutely the best vegan cheese dip ever, ever, ever and it’s so easy! I’m a vegetarian who doesn’t eat any animal flesh and some people think I’m vegan, but I still eat cheese, it’s hard for me to give it up, but finding this recipe is helping. 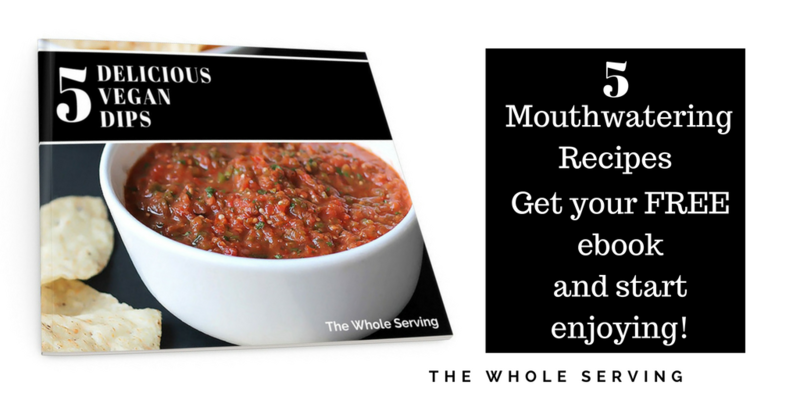 Let’s face it most dips of this kind are over-processed and have added ingredients we could do without. This is a much healthier version that has a smooth, creamy consistency that can fool anyone into thinking it’s the real thing. I added green chilies and Roasted Tomatillo & Tomato Salsa to the original recipe to make a Queso dip. That’s what so great about this kind of recipe, you can add ingredients to make it fit your taste. You can serve it up with plain tortilla chips or kick up the flavor of your chips with a simple sprinkling of spices before heating your chips in the oven, or you can be really healthy and serve with sliced veggies. It’s also a great replacement for cheesy Pasta or Mac and Cheese sauce. You have to, have to, have to, try this and do what I did, make it, label it, put in the fridge and see what happens. In my house my daughter used it to make a plate of nachos – she loved it, still doesn’t know it wasn’t real cheese. Boil potatoes and carrots in the same pot until soft, about 20 to 25 minutes. Drain potatoes and carrots, allow to cool slightly. Blend potatoes and carrots in blender with the next eight ingredients, until completely smooth. Transfer to medium bowl, add in the final two ingredients and stir to combine. Taste and add additional salt as needed. For spiced chips, mix 1/4 teaspoon each, paprika and red pepper and sprinkle over 11 or 12 oz. bag of tortilla chips on a shallow baking pan, heat in a 375 degree oven for 1 minute. NOTE: Store in an airtight container in the fridge, reheat before serving. If you make this recipe or a version of it, take a picture and share with me on Instagram, tag it #thewholeserving or leave a comment below. 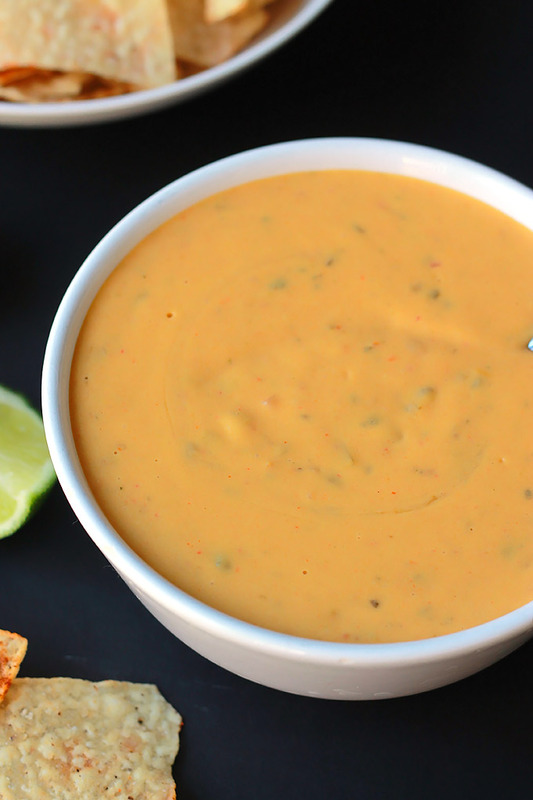 I’d love to see or hear about your version of this Vegan Queso with Spiced Tortilla Chips. Want more vegan dip recipes? 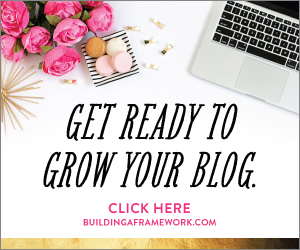 Click below and get your free ebook. I will pass this onto my son who is vegan :)) It looks delicious (excluding the cilantro which I strongly dislike). I hope he likes it as much as I do. The cilantro can be left out for those that don’t like it, it’s one of those herbs, people either like it or strongly dislike it. Oh my- just whipped up a batch of this and it seriously delivers! I substituted cauliflower and a turnip for the potatoes and it was still awesome (though I don’t know what it’s supposed to taste like with the potatoes). Either way– brilliant! 🙂 Thanks for this recipe! I’m glad you like it, it really is awesome, isn’t it! Good to know that even with substitutions it works. Thanks for letting me know. Thanks, I’m glad I found your party! Thanks Chrysta for including my recipe in your list. I am a new cook to real Dairy Free recipes. Where can I find the nutritional yeast flakes? Can’t wait to make this for the July 4th Holiday. Hi Cindy, I get my flakes from Whole Foods and you may be able to find them at Sprouts in the bulk section. I made some nachos for dinner and Taylor didn’t have a clue that it wasn’t real cheese. I hope Dan likes it. Here I go to Whole Foods. Queso will be my side dish for tomorrow night’s family get together. I bet thiss Queso will make amazing mac and cheese too. I needed a good cheese recipe, thank. It does, I also use it sometimes for grilled cheese. I simply use it cold from the fridge and it softens as it warms. Just whipped a batch of this and it was delicious. Definitely didn’t miss the dairy. I will make this again. You made my day! I’m so glad you had success with this dish, it’s one of my favorites. I love making it and sharing with it with my “Oh no I won’t eat that” friends and watching their faces when I tell them it’s not real cheese. OMGosh! So GOOD! I have missed cheese sauce for years (no dairy for me). I left out the oil. Phenomenal! thank you! Annette I’m so glad to hear that a version of this recipe worked for you. It’s so awesome! What kind of potatos do you use? Hi Tiffany, I am sorry I’m just responding. I have been dealing with a sick loved one who recently passed away. I used Yukon Gold potatoes, they are smooth and creamy. I’m glad you like the recipe. Kathryn, I’m glad you like it. By the way, you can also use this sauce to make vegan mac and cheese. Does this freeze well? I’m the only one that eats vegan in my house and it’s a bit too much for one person. I could obviously cut the recipe in half but I’m hoping to freeze for easy use later! Thoughts? Kristine I’ve never tried freezing it. When I make this it usually only last a few days. I’ll have to give freezing a try. I had a urge for this delicious cheese dip. 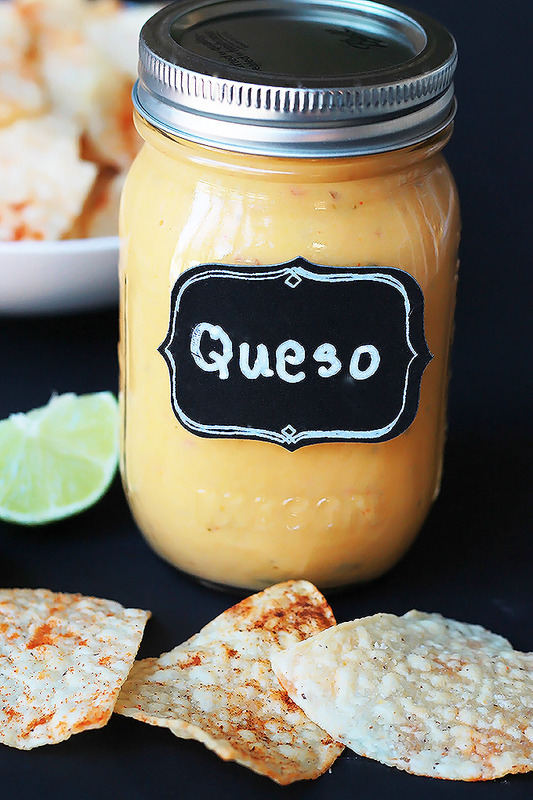 This is my favourite go to Queso recipe. 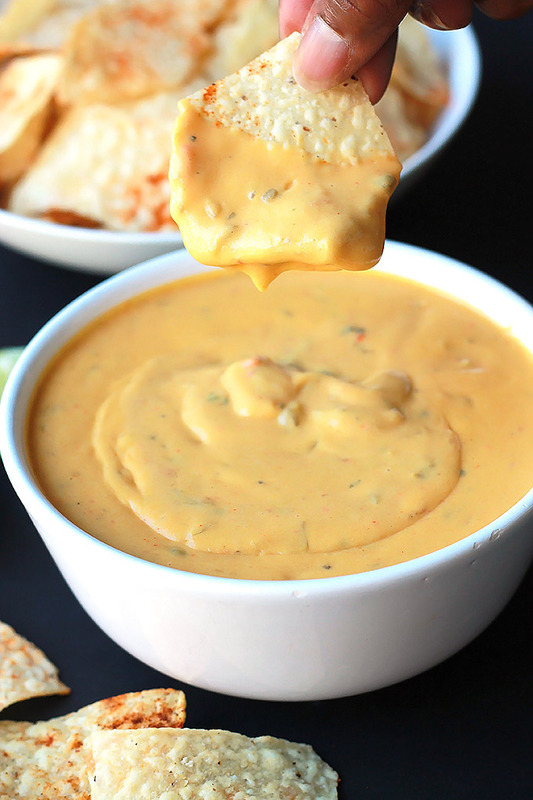 WE LOVE this queso recipe! My boyfriend and I have been trying for a while to find a good vegan queso recipe that isn’t gritty and we failed for a long time. We made this a few weekends ago for college game day to have some snacks and it was a hit! He even requested that I make it today for football games. While I followed the recipe for the base of the queso recipe, we make something that we call “dirty queso” and add black beans and jalapeños! SO YUMMY! Thanks for a great recipe! Wow, Mackenzie that sounds very interesting, I like the name. I’m glad you and your crowd are enjoying and having fun with the recipe. Just made this recipe and it seriously delivered. The texture was spot-on and the taste was amazing. Definitely satisfies the craving for cheese.